8.25 points at 69 votes (rank 46). Are you bored by all the same sports games, were all the usual olympic events are chewed through? Then welcome to California, home of the most spectacular sports in the world! We start in Hollywood. With the skateboard the player has to proof his ability by showing reckless manoeuvres in the half pipe. Following, we go to San Francisco. When doing the trend sport foot bag, you need to keep a small ball in the air using all parts of your body except the hands. Next you go down to the beaches of California. During skating you cross an exciting obstacle course. Then it is the turn of the supreme discipline of all beach competitions - the surfing. In search of the perfect wave the player glides along the wave with a surfboard. In the next discipline one shows stunts with the BMX bike on a country track. The last event is frisbee and takes place in the beautiful Yosemite. The games differs to other Epyx Games also that the player doesn't compete for a nation, but for a sponsor and that there are trend sports used. The sponsors to choose from are not invented but they really exist(ed), which for sure hoped for a higher degree of popularity and a better image by financing this game. One of the biggest trends of the 80s were skateboards and the idea to cause funny self-inflicted injuries with them. And how could you do this easier and nicer than in the half pipe? You have a maximum of 90 seconds time to do the most and most spectacular stunts that are possible in this discipline. To call it stunt is a bit exaggerated, there are only 180° turns, but depending on the speed and the resulting jump height there are more or less points for each succesful turn (max. 999). You can do three turns: kickturns, handplants and aerial plants, which are made by pressing the fire button and the direction at different poins of time. When doing high jumps the turns are very hard to manage, while doing turns in slow speed is easier. Too long or too short turns lead to a fall, the same happens when trying to turn into the wrong direction. Be careful: when you fall off the board 3 times, the game is early over, which will happen often to untrained players as half pipe is really tricky. the correct point of time for the turn is just before the highest reachable point. Foot Bag is just fun. The aim of the game is to hold a small ball as constantly as possible in the air and to do tricks, which give extra points, for 90 seconds. You can play the ball with the head, knee or foot and the heel, turn and perform lots of funny wrenches. Two additional possibilities to get some points are: the low flying seagull, which sometimes flies over the screen and which you can plant a nice hit on ;o). And if you jockey the ball over the edge of the screen, it will be thrown back and you get bonus points for the direct catch of this throw-in. Especially with several players foot bag is a guarantee for laughs, as the more people will watch and crack silly comments, the less tricks will work. It was never easier to make a fool of oneself! Here the ball can fall to the floor endlessly, this discipline doesn't stop prematurely. Or better said surf ride, because a sail as used in the classic wind surfing is not used here, you just have a naked surf board. With this you have to try to show as many tricks as you can and keep yourself on the board. It is important to have enough speed, otherwise you will get swallowed by the breaker which follows you. The tricks that can be made are 360° turns (only manageable with a big head start to the breaker) and jumps, whereas the jump angle needs to be the same as the landing angle (e.g. when you jump upwards vertically, you have to do a complete 180° turn in the air), because if the aforesaid angles are different, you will lose balance an fall from the board. The maximum time is 90 seconds and here also after three falls from the board the discipline will end prematurely. Here you play a small girl, who drives along the waterfront with skates. On this there are lots of obstacles (potholes, garbage, sand heaps and much more) which you either have to drive around or jump over. There are points for the distance covered and the jumps (depending on the speed and whether with or without 360° turn). Also in this game the rule applies: if you break with the face three times, you need to stop early. the one who falls three times is out! A discipline, which is bloody treacherous and extremely invites you to get jaunty. You sit on a small BMX and you have to master a show-jumping course. On the way there are square timbers, buckets, tyres, stumps and lots of other stuff on the track, which you again have to go round or jump over. Furthermore there are many hills and some jumps which give the player the chance for spectacular and risky show interludes. Possible ones are a tabletop (you lie horizontally in the air for a short time, rather easy), a 360° turn (also not too bad), a backflip (only for the professionals) and a somersault forwards (absolutely deadly). The danger while performing the latter two is to have to little drive and to land on the head which instantly ends the game, as with a neck breaking you usually don't drive any more. Otherwise again here the fun is over after the third "normal" fall. If you make it to the end of the track, you have to manage to break on a small plateau and to stop there, then you get some more bonus points, depending on how quick you performed the course. if you stop exactly on the finish line, you get bonus points! Points go to a maximum of 65535. Then the counter starts again at zero. Finally there is a less hectic discipline to master. Flying Disc is nothing else than throwing and catching a frisbee. You first control the thrower, give him the speed and the angle and the the disc flies through the air. Further back there is a second person which you control after the launch. This second person should catch the arriving frisbee, which is far from easy as you walk slower than the disc flies. You receive points for the distance you reached and for if and how (running, standing or during a jump, with or against the flying direction of the disc) the disc is caught or not. Every player has three shots, which are summed up. By the way there is a small gag hidden here. When you wait too long with throwing, a UFO will come flying and kidnap the catcher. But you only see it in the bar above the normal picture. while moving the second player the points are rising slower! The graphics were excellent fot a C64, nowadays of course they seem outdated, but if you grew up with a Commodore you won't mind this. - The sound rocks! Alone an ingenious theme for the intro delights the player and also in the main menue you can find a nice background music. Every discipline has always an adequate sound backdrop with 80s beach pop music. The song at the intro is "Louie Louie", the one during Surfing is "Wipe Out" (how adequate). For the means of a Commodore it was the best. - The controls are also top, it is fully done by joystick and the characters react directly to the commands of the player, there is nothing to complain about. 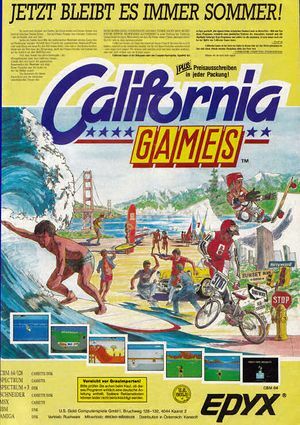 The menu of CALIFORNIA GAMES offers the choice of six options. To make a choice use your joystick to move the cursor to the desired place and then press FIRE. You can also choose an option by entering the corresponding number. To play through all six disciplines. You will do the sports in the following order: Half Pipe Skateboard, Foot Bag, Surfing, Skating, BMX Bike Racing and Flying Disc. First you are asked for your name, which you enter, and then you are asked to choose a sponsor. Enter your and then press FIRE. Use the stick to place the cursor on the desired sponsor and press also here FIRE. Repeat this process for every other player (up to eight). The procedure is similar to the one in option 1. But you only compete in those events that you have chosen. To choose them, move the joystick to the corresponding number of the sport and press the FIRE button. The events that you have chosen are shown in violett. When you have finished your personal choice, then move the cursor to DONE and press FIRE once more. 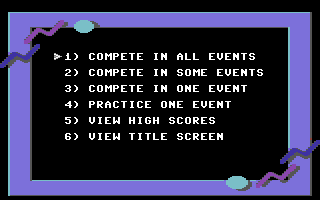 The procedure is similar to the one in option 1 and 2, but here you only compete in one single event of your choice. Choose the event by moving your cursor to the corresponding number and press the FIRE button. During practicing units the gained points are not saved. Choose an event by moving the joystick to the corresponding number and press the FIRE button. Here the record for the single disciplines are shown together with the name of the player that achieved them. To return to the main menu, press FIRE. Here you can view the title screen once more. To return to the main menu, press FIRE. After the end of the event, the statement who has won is made. Position 1 counts 5 points, position 2 3 points, and position 3 one point, same as in the former games. After adding you get the end result. Another incentive for top performances is of course the world record bookkeeping for every discipline as already mentioned at the beginning. How do you get a 10.0 in Surfing? Some tricks with/without turns in different angles (doesn't need to be all variations). I once got 10 points with only 11 jumps, of which were 6 times 45° with turn, 2 times 67° with turn, and each once 45° without turn, 90° with/without turn. No spectacular jumps to the left (look nice, but are not necessary), or also the flat jump 23° with turn. Jumps close to the crest are supposed to give more "points", but I have also received the 10.0 with only 3 of these jumps. It is very important to surf some time in the wave/tube (20-40 seconds). For this just do a 360° turn (without jump) and move with fire up/down to get a bit slower. The following is a jump that seems to be very important, especially for the guy with the moustache! A 90° jump, where you dunk back into the breaking wave. For this just speed up a lot until the crest is almost fully at the left border of the screen (it should still be visible a bit). Then pull upwards for the 90° jump, turn and in again. This way you should exactly hit the breaking wave. Finally, when the siren sounds (time over), you should just surf horizontally in the lower area of the wave. No known cheats or pokes. Guybrush: "Still today California Games offers great fun when it is played with several people, the more, the better. On our C64 revival parties, which we hold from time to time California Games is compulsory, as it is timeless and ingenious. Without having to configure any settings you can start, the disciplines are short and simple, through which the game stays interesting. It's just a classic. Whoever has never played this game, has in my opinion a gap in education, which needs to be filled. FighterXXS: "A clear favourite for multiplayer sessions... (concerning this issue I go along with the above critic). As "single-player" the motivation is considerably smaller, provided you don't train for the next "multisession"..."
Spaceball: "My absolute favourite part of the Epyx Games Series. 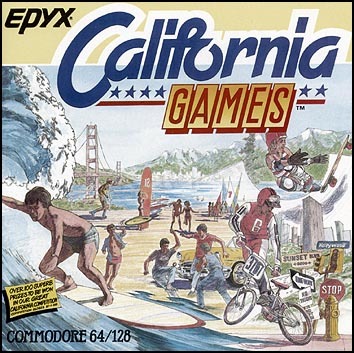 For me California Games is the highlight of the Eypx Games Series. Even Winter Games can't reach it." Since 11.04.2008 the game is available as download for the Nintendo Wii Virtual Console. This page has been accessed 30,979 times.